It rained for most of the day. After my coffee I had the chance for a brief stroll. I wandered into the woods. 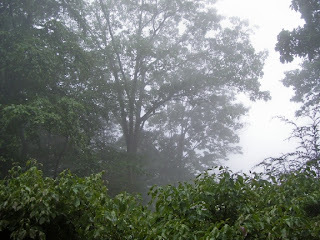 It rained gently for most of the day. At 2:30 the sun still had not shown itself. I went to Lowes to wander. for a month at the beach. I am now all alone. 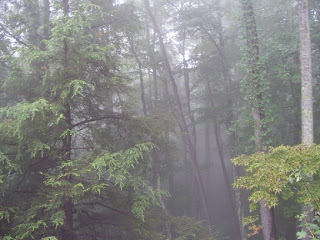 The only sound for most of the day was the gentle rain. It rained for most of the day. Gently. 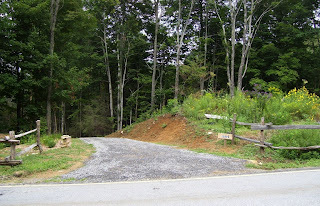 It did not wash away my newly seeded hillside. By 5:00pm the sun made a brief appearance. I went outside and spread more grass seed. 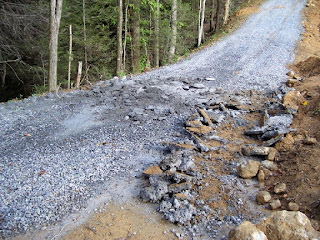 Does this look like an abandoned logging road or DOT highway pullout? Is the garden so ratty it looks like it has just been let go and turned into an abandoned field? Today while I was working on my column repairs a big fancy white SUV pulled into the top of my drive. A well dressed women got out of the passenger side and walked into the roadside vegetable/flower garden. I was watching. 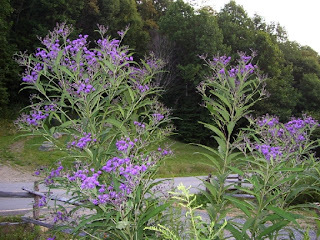 She returned to the big SUV with a fist full of Ironweed. I hollered, "Excuse me. Just wait a minute there." 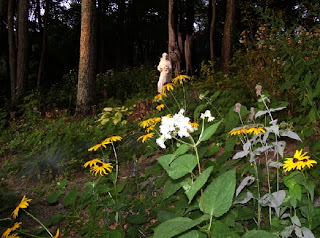 I went up there and asked her if she thought it was ok to come on private property and pick the wild flowers. She and her accomplish, another woman both said "Oh we didn't know." Didn't know what I want to know. "I only picked the pretty purple ones" she said. "Yes I like those too." I have already had the bejesus scared out of me about theft of construction materials and as you can see there is not a working gate up yet. This time it was only flowers. 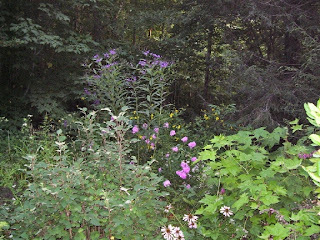 The Ironweed is what they were after. She just yanked the tops right off two of the stems. To the right, out of the picture are the sad looking fabric covered rows of peppers, squash and tomato. The cucumbers bit the dust this year. How tidy does a place have to be before a person recognizes it as some one's garden? 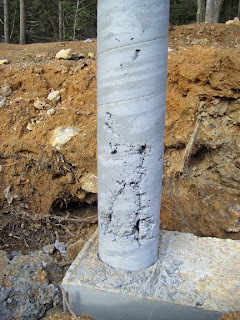 In the meantime while not protecting my valuables, I have been busy mixing 5000 psi concrete with fiber mesh added and pouring it into 12 inch diameter tubes that have been placed two feet up around my 8 inch diameter columns. The tops which turned out much better will have the few minor flaws patched with a masonry coating mixed with an acrylic fortifier. I am making very sure this concrete pours well and gets a good vibration. The taller columns will get the same treatment with 12 inch diameter tubes placed at seven feet up on the 8 inch diameter columns. I'm gonna be mixing concrete for a spell. It has started raining again and the summer is slipping away and so is my hillside of saprolite subsoil every time it rains hard enough. 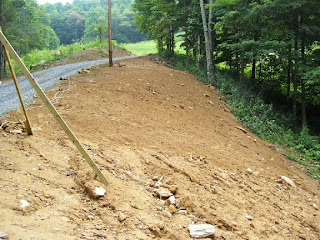 I have finally begun seeding this hillside with a blended mix of fescue grasses. Nothing has germinated in this soil for three months. It was obviously seed free. 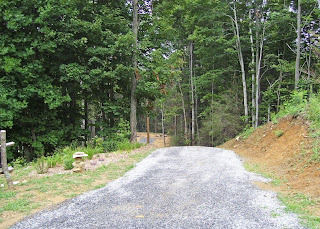 The grass is just temporary, something to hold the ground in place and begin the process of building a living soil while I build a small cabin. 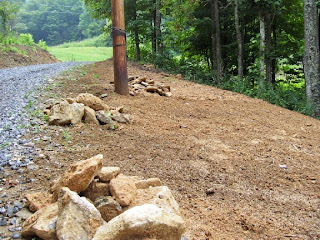 Small piles of rocks are beginning to form as I continue to work the ground in bits and pieces. We all know what Piles O' Rocks mean. I am going to have to make some thing with all these rocks. Some thing new and different. I'm thinking. I also have five three foot tall sections of empty tube forms left over. Hmmm. 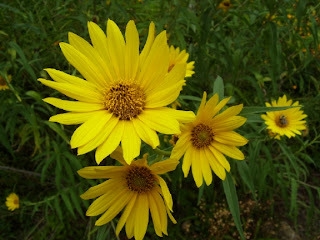 The fancy ladies in the SUV didn't pilfer any of these perennial sunflowers. I am fairly certain this is Helianthus maximilianii. 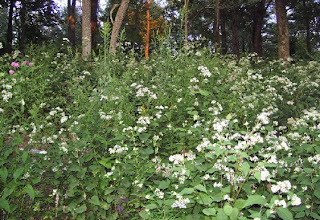 Perhaps once I start organizing some of these wild beauties people will think twice before they help themselves to the goodies in the roadside vegetable and flower garden. One column bottom is done. And a mouse fell through the hole in the ceiling caused by the leak. Squeak. then Chuck added paste to the ritual. Maybe Stuart will approve of this. 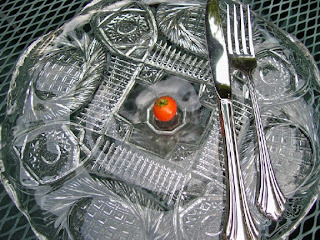 I could not resist the challenge and an excuse to touch the tomatoes and am offering up two submissions for the Ritual of the Tiniest Tomato. This lovely Cherry Tomato was grown at an elevation of 4000 feet and survived a monsoon and then a drought. It was pelted by hail and survived intact to ripen to tiny red juiciness. 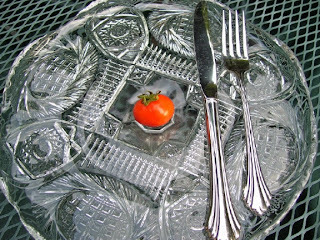 Yea whoopee, a tiny Cherry tomato, put it on a big plate and it looks small,big deal, I can hear you all saying. Really I am not all that impressed with this miniature, smallest of the bunch either. The wild cherry tomatoes that grew as weeds in Hawaii were regularly this small or smaller and had a zap of flavor that was a real treat. This tiny Tom did have a nice flavor and a burst of juiciness in the center. It was ok. There were other troubles in the tomato patch. This guy was looking a little piqued. 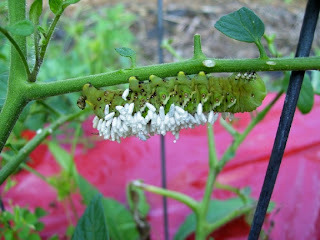 When I saw one of these guys several weeks ago I did not pick it off and fling it into the woods because I am not allowed to touch the tomatoes since I smoke. I wonder if it is the same one. 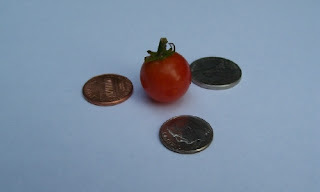 My second submission for the Tiniest Tomato is this truly dwarf Beefsteak Tomato. There was no tag on this one but its neighbor was labeled "Goliath". I quizzed the resident gardeners, but they were no help in telling me a cultivar name. They did think as a habit they always buy several different varieties. Added: I found the Tomato tag on this baby"Bush Early Girl". I am too afraid to eat it. It isn't only plants that do not grow as well as you intend them to. 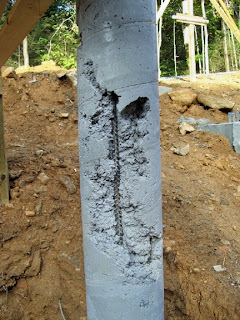 As I feared there were air pockets in my cement columns and some had had the steel pushed to the side. It was not a complete disaster. They are still stable and mostly sound for now. They have to be fixed though. 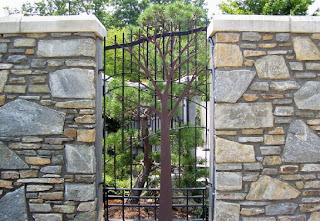 Moisture and cold could cause freeze and thaw damage and they could crumble over time. The shorter columns were fairly decent and we will mix epoxy with some kind of mortar/cement and patch them. Only about twelve inches of these will be above ground. The tops of all the columns were pretty good from me poking them with a 2x2 piece of lumber. 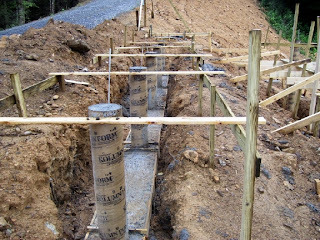 The taller lower columns will have a larger ten inch diameter tube, maybe corrugated galvanized metal, that would actually look kinda cool or Schedule 40 PVC which would be easier for us to cut, placed over them up to about seven feet and filled again with soupier flowing concrete. 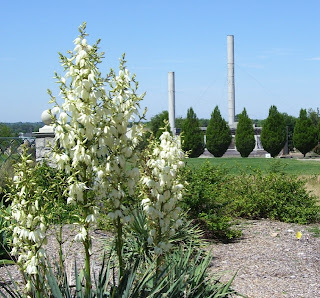 This new tube will remain in place on the exterior of the column. They will range from four to six feet above the ground. Both the top and bottom of the taller tubes were pretty good. The sheer weight of the concrete filled the bottom and my poking filled the top. The centers are a little scary and will be fixed by re-pouring around them. 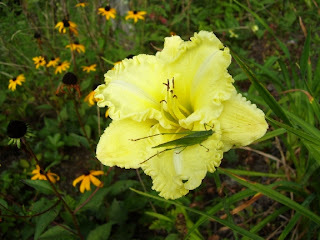 Even Daylilies have bad days. Now my semi-hollow columns were bad enough but my day started with the ceiling in my luxury basement accommodations collapsing in the middle of the night. The first tile that fell woke me, but I did not see what it was. The second tile falling woke me again and I saw the roof had a hole in it. I figured there was a leak. When the third tile fell I gave up and got out of bed and began the hunt to find out what was leaking. Now 17 hours later it is still leaking. 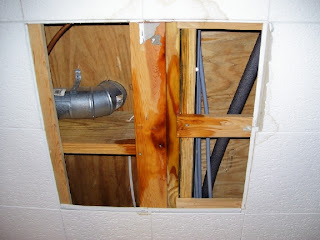 We turned off every single line in the house individually which can be done in the basement closet where all the shutoffs for every toilet, sink, shower and appliance is located, to try and diagnose the problem. There does not seem to be a leak in any of the water lines. It may be the large S trap on the washing machine drain line above my head that finally gave way when I washed my work clothes yesterday. So tonight while the trap slowly drains I will enjoy Chinese Water Torture Dreams or Enhanced Water Resting as some might call it. There are some days when you just feel like pulling your hair out. 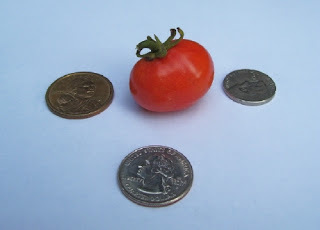 Then along comes the Ritual of the Tiniest Tomato and you realize that next year things will be much better. The Japanese Anemomes are blooming now. I read on Chuck B's blog that it means the end is near. 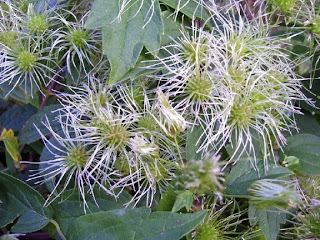 The Angelica gigas is adding a dusting of white via the pistils or stamens. I am not quite sure which. 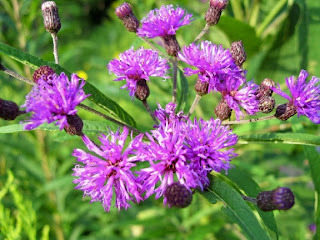 The Ironweed, Vernonia noveboracensis is really rather dramatic in stature and the boldness of its color. I am really liking it. I am watching to see how long of a bloom period it has. 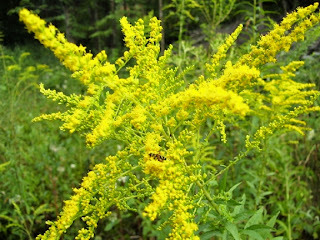 I am counting three species of Goldenrod, Solidago so far. I bet there are more. But this is what I really did today. We placed four and a half yards of concrete. Yes placed. You do not pour concrete. If you pour it, it means it is too soupy. I think the guy with the concrete pump poured it anyway. Yesterday after we passed inspection it poured rain, three quarters of an inch in about an hour. Today just as we finished placing concrete and stopped for lunch it poured rain and hailed. He was very messy, slopping concrete all over the place. 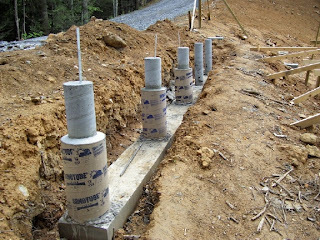 We did manage to fill all the forms and all the tubes that will be the columns that support my cabin.... however my contractor did not order enough concrete and the second load was a bit on the dry side. The messy concrete pump guy did not seem to make much of an effort to keep the steel in the center of the columns as he poured it in and it was so chunky coming out I am afraid there may be air pockets in the columns. My contractor does not seem to be worried. 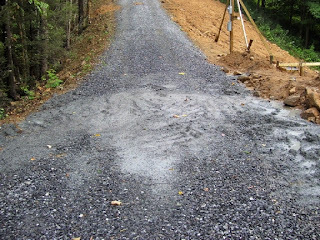 Then the messy concrete pump guy spewed enough "extra" concrete on my gravel driveway to make an entire stepping stone path. The lesson I keep learning from my mistakes is that I need to be more in charge. Tomorrow we will peel away the cardboard tubes and erect the first girder. Monday we have a lumber order being delivered. I might just have the floor of a cabin by Wednesday. Have I mentioned that placing concrete is not in the least bit enjoyable. I really needed to buy a plant for myself today. What I really should get is some grass seed for my barren hill of saprolite before it all washes away. 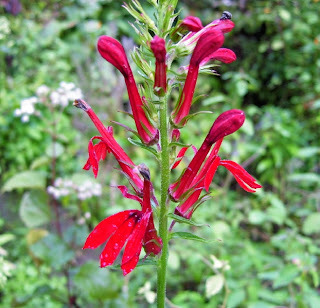 Almost as good I found this Lobelia cardinalis blooming in the sunny utility valley along the upper portion of the stream. I saw a lot of these when we rafted down the upper Pigeon River. I made our raft guide take us over to some of them so I could get a better look and be able to ID it. 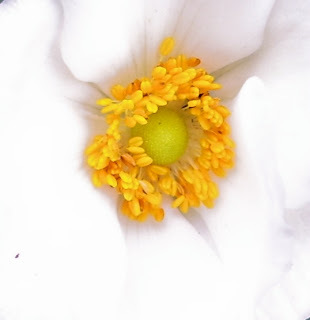 The Anemones are blooming. 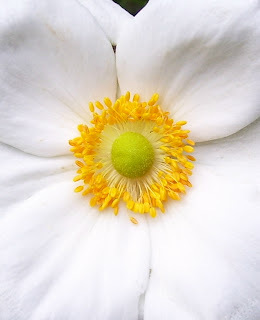 The Anemones are blooming. Another day is done, Outside of Clyde. 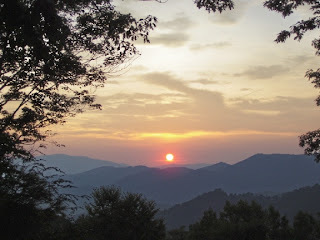 A new phase begins tomorrow with the rising sun and changing seasons. 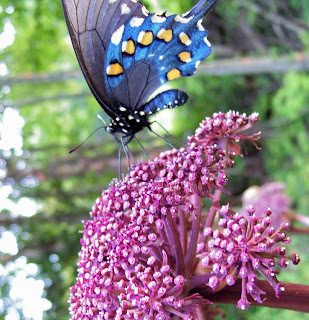 I thought for a while that this butterfly had died in the act. It was completely motionless and didn't move even when two large bumblebees sauntered right up to it. I took quite a few pictures very closeup and only one of the dern things came out in relative focus. Thank knob for digital cameras. You can take tons of crappy pictures and it don't matter. 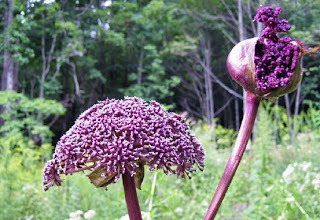 Now that this plant is blooming I am going to have to say this is Angelica gigas, Purple or Korean Angelica, not the A. sylvestris that I figured a wild thing would most likely be. There are as many Angelica species it seems as there are Joe Pye Weeds. It is making my head hurt a little. 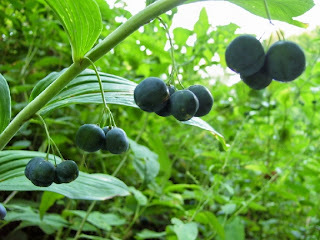 The dangling balls on this Solomon's Seal, Polygonatum biflorum, I hope, really fascinate me. It is just such a unique arrangement of fruit and plant. They are changing from green to blue. Will they turn black or red next? I need to look this up and find out what it is. 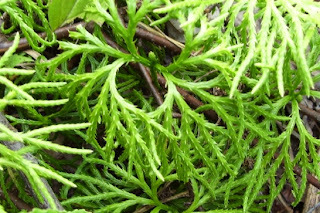 A Selaginella maybe? 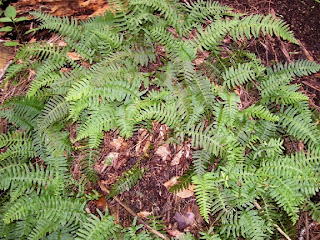 Like most things here it forms colonies that spread over a wide area and mingles closely with the neighbors. 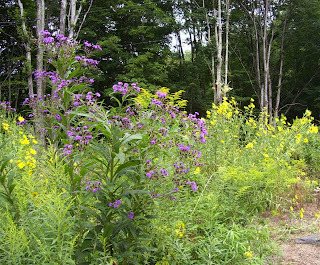 There are giant weeds here that bloom in every imaginable color. Now as I walk through the meadow they are over my head. I am dwarfed in a field, walking under what in most places would be grass, but there a very few grasses in this field. 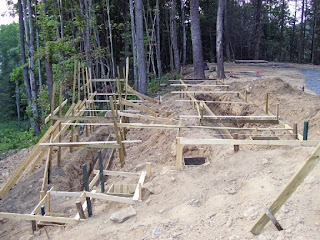 Part of my blogger block this past week is that we have been very busy trying to get all the footings in and filled with steel, the tubes erected that will become the columns that support my cabin, those filled with steel and supported in place to hold tight while they are filled with concrete. It all has to be level and parallel. 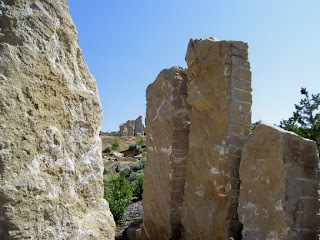 The columns closest to the road are 40 inches tall. 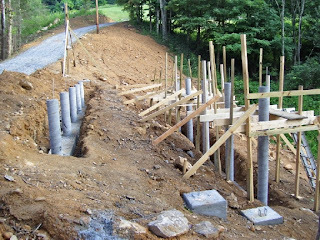 The columns in the lower trench are 104 inches tall, over our heads. We are finding this shape in the void of space. It takes lots of measuring. 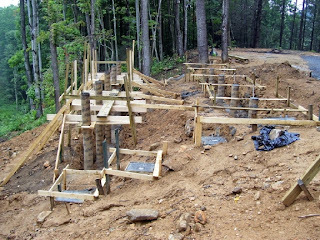 I want the cement poured and my main support beams in place before my contractor heads to the beach next Thursday for a month. By the time I come in have dinner, a bath and read a bit of your wonderful blogs, it is late, I am tired and no words have been coming out. In a foundation work lull I managed to rough grade a portion of the re-spread saprolite soil and eye it for a near future planting. This area above the electric pole should be safe from construction traffic. 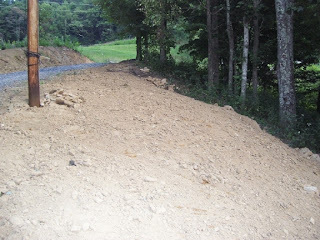 Access to the future septic drain field will be lower down this slope. Hmm, what should I plant there this fall? 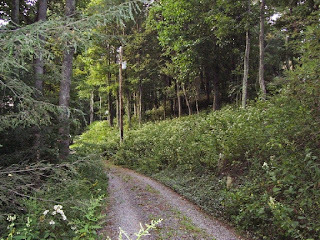 No tall trees allowed, this is the utility line easement. Now the tubes are up and we are scheduled for inspection on Thursday and concrete pouring on Friday. Hooray! Hooray! Just a few minor details to work out before the concrete truck and pump arrives. Have I mentioned that I have never built a house before. 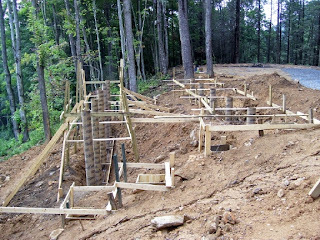 We passed inspection for the foundation this morning. Yippee! One single cloud has decided to sit on top of us and dump lots of rain. Boooo! We sure need the rain for the garden though. I need to get something out of the way right off the bat. I did not get the job I applied for at the NCA and I am very disappointed. It is having a bit of a cascading effect. I am quite good at ignoring my feelings, so I need to acknowledge my disappointment before it can show up in some unwanted or unintended way. Now I have to really go out and look for a job, something I have not had to do for the last twenty years. There are a few hurdles I must get through it seems to start a new life on the mainland. So I garden and I visit gardens again to meet new friends. Xris from Flatbush Gardener and I met up at the Arboretum to start our day together. 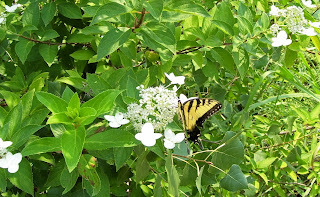 These Tiger Swallowtails seems to pause when they sip nectar making for nicer pictures, unlike the black and blue Spicebush Swallowtails which flap non stop and are hard to catch on pixels. This bug was barely moving. 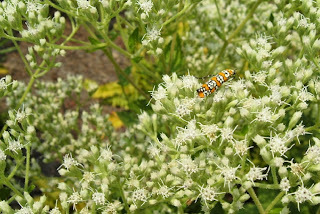 It didn't have to go far to get to the next flower on this Joe Pye relative, another Eupatorium. I did read the label, but I did not retain the species name. Maybe Xris did. 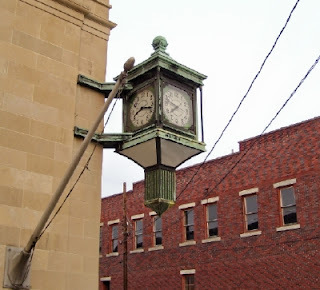 After a nice drive from my place back to Asheville through the back woods we ended up in downtown Hendersonville. 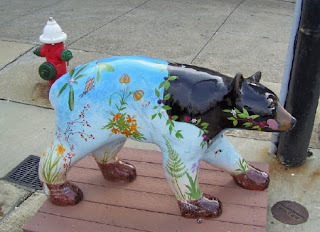 The town had pretty much closed for the night and there were bears wandering through town. You can take a bear out of the woods, but it still looks like they may have the same bathroom habits. 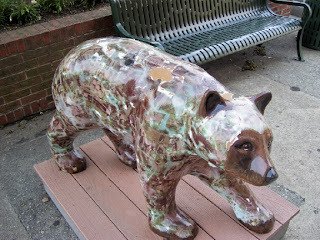 This bear looks like it may have been in a fight. Poor thing has a chunk of hair missing from his shoulder. Where was this bear when I needed him? 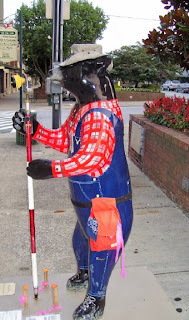 I have spent the last week and a half measuring things and without the fancy laser level this bear has. It was a very nice downtown. Lots of old buildings with small shops, all closed, on big sidewalks, very pedestrian friendly. I should have taken pictures of some of the many well done large planter boxes. I guess you need to get there before six.